The ratel, also known as the Honey badger, is famous for their tenacious attitude. Wild ratels have been documented attacking lions and hyenas in the wild when cornered. Our standard protocol at San Diego Zoo Global is to pull small carnivores to the nursery to be bottle raised when they are destined to be Animal Ambassadors. When considering the nature of the ratel, and that this would be the first ratel that we know of to be raised into a training environment, we were cognizant of the fact that the animal might not have long term success in our training program. From that assessment it was decided not to pull this animal from her dam in an effort to avoid her being imprinted on humans which could decrease the chance that she could go into a breeding environment as an adult. After much discussion about the slower development of ratel cubs in comparison to other small carnivores, we proceeded to let her be parent raised with daily socializing. The training and handling of any carnivore requires proactive and consistent training techniques. Creating a consistent and reinforcing environment without the rehearsal of aggression can lead to long-term success and positive relationships. This paper will discuss the socialization progression of a parent raised cub born at the San Diego Zoo in 2008; operant conditioning techniques used to harness, leash and crate train the female ratel “Benzy,” as well as managing potential territorial and possessive aggression and her overall lack of patience. In 2009, a young male raccoon (Procyon lotor) came to America’s Teaching Zoo at Moorpark College. Students at the zoo immediately began desensitization training as well as collar and leash training. These methods were successful until early 2011, when after a series of aggressive events he was temporarily deemed a protected contact animal and no free contact work was to occur until a new training plan was created for him. In late 2011, the assumption was made that the restraint from the collar and leash was the cause of the aggression. Therefore, a training plan was developed with the goal of working him off-leash safely. The cornerstone of this training plan was the development of a strong recall that he would choose over such distractions as scents, loud noises, and other animals that would be unavoidable when taking him out of his enclosure. This paper will discuss the specifics of the recall as well as the positive conditioning techniques used. We will describe the steps taken as well as some of the mistakes made during the training process. While working an animal such as a raccoon off-leash is a risky endeavor, we found the use of the recall extremely effective and potentially useful in training other animals with similar behavioral issues. Using these techniques we were able to take an adult male raccoon beyond the borders of his enclosure. In 2000, a male palm cockatoo (Probisciger aterrimus) arrived at Cleveland Metroparks Zoo to participate in the Zoo’s live animal programs. Prior to his arrival, his records indicated that he was a feather picker. The palm cockatoo’s feather condition appeared to fluctuate over time. It was observed that his feather condition appeared to be at its best when he was actively being trained. This study investigates how positive reinforcement training affects the feather condition of this palm cockatoo. The amount of time spent training the cockatoo was altered throughout the study. Training occurred for 30 minutes a week during baseline, then a goal of 60 minutes minimum a week was set for the experimental phase, and finally the training was reduced to 30 minutes a week again to return to baseline. Behavioral data was collected and the feather condition of the cockatoo was recorded. It was hypothesized that the cockatoo’s feather condition would improve as the amount of time spent training the cockatoo increased. As training time increased, the palm cockatoo’s feather condition improved suggesting that training had a positive influence. Most behaviors did not appear to change during the study with the exception of swaying, pacing, and inactivity. Training will continue for the palm cockatoo and Zoo staff is currently investigating the effects of diet on the cockatoo’s feather condition. Cheetah running programs are becoming prevalent in zoological facilities across the globe. The Cincinnati Zoo and Botanical Garden (CZBG) has led the pack of this trend and began running cheetahs off zoo grounds in the early 1990s, mostly for the health and enrichment of the cheetahs. In 2007, the Cincinnati Zoo opened the Cheetah Encounter show on zoo grounds to share the cheetahs amazing speed and agility with visitors. The show popularity has grown and each year the Cheetah Encounter staff performs approximately 200 running shows, with 2 cheetah runs each show. The Cheetah Encounter collection consists of 3.3 cheetah and each cheetah runs between 5-7 times per week, both on grounds for the show and off grounds for training. Though the Cheetah Encounter Show only runs from May- October for the zoo visitor managing the cheetah running program is a year round process for the trainers. Cheetahs are superb athletes and clever hunters; mimicking their natural behavior and instinct in a captive environment requires constant attention to detail, careful planning and endless creativity. Don't Forget to Pack Your Behaviors! Consistency in training is essential to a successful conditioning program. Maintaining consistency with fellow trainers proves to be an on going task. Training new keepers in, on animal behaviors takes matters a step further. Keeping good records, descriptions of behaviors and communication between institutions to carry behaviors with a transferring animal may seem impossible! It isn't! Follow a journey of a Jaguar and his training program from one institution to another. From one section of a zoo to another and from one keeper to another........and another. The communication between veterinarians and keepers and the dedication to excellent animal welfare for an animal, keep his training program in full swing. Together we maintain the health and well being of this magnificent cat! In 2012, the Animal Ambassador Team at Tampa's Lowry Park Zoo took on a large venture which consisted of training seven newly fledged macaws to fly as a flock. While most zoological facilities have free flighted shows, TLPZ included, this behavior was designed to reach a broader audience. To train the behavior, seven stations were placed along a winding path within the zoo. The birds were to fly that path and kennel themselves at the front plaza. This first leg of the behavior culminates with a zoo visitor pressing the button that opens the kennel doors. The birds then fly over the zoo visitors, around a large manatee fountain and use the stations to return home. The stops that the macaws make at each station became such valuable moments for the trainers that we decided to employ them as meaningful defining moments. Once our guests learn that the animals are trained to partake in daily exercise, they are intrigued as to how we have trained the birds. The zoo paths become a stage that the birds and the guests share making the connection between the human and animal world that much closer. We can now successfully reach the entire zoo guest demographic compared to only those who are at the Birds of Prey show. The quick stops at the stations allow us to promote our bird show, keeper talks, positive reinforcement training and parrot conservation. This borderless behavior occurs twice daily and is roughly .40 miles/.63 km a day. The Dallas Zoo’s Giants of the Savanna opened in May 2010, giving guests the chance to experience a variety of African species in naturalistic exhibits intended to encourage the expression of species-appropriate behaviors. The Predator Rock area, home to cheetahs and lions, features a specially designed area where keepers share with guests how positive reinforcement training helps provide animals with exemplary levels of care. 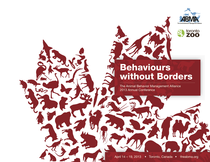 The 2011 ABMA Conference was an exciting opportunity to observe how natural behaviors are being incorporated into public demonstrations by industry peers. The addition of natural behaviors to the daily Predator Rock demonstrations was the next step to enhance an already popular and well-attended guest experience. Keepers will showcase not only husbandry behaviors such as voluntary injections and blood draws, but also behaviors and features that make lions and cheetahs some of Africa’s most iconic predators. Proposed behaviors for the lions include presenting a paw and opening the mouth against the viewing glass, a vertical leap in front of the viewing glass, leaping across the exhibit rockwork, and running as a pride around the exhibit. Proposed behaviors for the cheetahs include presenting themselves laterally against a viewing window to allow a guest to measure/inspect them, and running at speed around the exhibit. These behaviors were chosen to showcase the cats’ size, speed, agility, and anatomical specializations; and so that guests could participate in the training experience. This paper highlights the process taken to accomplish this ambitious project, including planning, working through difficulties, and finding success. Penguins, on average, eat 10% of their body weight every single day. Multiply that by over 200 birds made up of 4 species- Kings (Aptenodytes patigonicus), Gentoos (Pygoscelis papua), Chinstraps (Pygoscelis antarcticus) and Rockhoppers (Eudyptes chrysocome), ranging from 5 pounds to 40 pounds, and that equals hundreds of pounds of fish fed out every day! To hand feed each penguin would take hours, and with a small staff, large number of animals, and multiple other responsibilities, time is precious. For years, SeaWorld San Antonio has fed their penguins the bulk of their diet through self-serve pan feeding. Training each penguin how to feed themselves out of a pan can take months, in some cases years, before the bird is truly eating on their own. This training process was improved in 2012 by implementing a formal training plan with 1.1 King penguin chicks. The chicks were set up for success by having clear expectations, and although the training process took more time initially, its effects are long lasting and the two chicks were eating on their own faster than any other King chicks in the park’s history. Since 1993 the Vancouver Aquarium and the University of British Columbia have run a research program dedicated to understanding the 80% population decline of Steller sea lions (Eumetopius jubatus) over 30 years in the North Pacific Ocean. As a part of this program, we collaborate with researchers worldwide. Recently, in collaboration with a group of scientists from Woods Hole Oceanographic Institute and Texas A&M, our open water trained Steller sea lions participated in one of the first ever attempts to investigate decompression stress in free diving marine mammals. In order to collect sufficient data, our 0.4 sea lions each participated in 12 voluntary anesthetics, eight voluntary blood draws from the hind flipper, and 24 voluntary ultrasounds over two two week periods, separated by approximately two months. This work was all in conjunction with collecting respirometry data while diving and foraging at 50m for 30 minutes in an open water setting. At the end of these dives, the animals were loaded back onto our transport boat and returned to their holding pens. The animals were under behavioural control for upwards of 90 minutes for each research session. While we were collaborating with the international researchers on this intensive research, we had numerous successes and overcame some great challenges, all under some tight deadlines.